If you noticed that your computer acts weird and you suspect that your system might be infected with some kind of malware or other malicious software, STOPzilla offers you the ultimate malware and spyware removal tool. STOPzilla AntiMalware was designed to eliminate existing online threats and ensure that your system is malware and spyware-free. STOPzilla AntiMalware was developed to destroy existing threats that already infect your files in the system. It does not attempt to prevent new threats, like other security software. In order to provide the best protection against malware and other cyber threats, STOPzilla AntiMalware complements other antivirus solutions and works together with them without any negative impact on system performances. STOPzilla malware threat databases ensure advanced malware detection and removal. It detects and removes even the latest malware and malicious software. 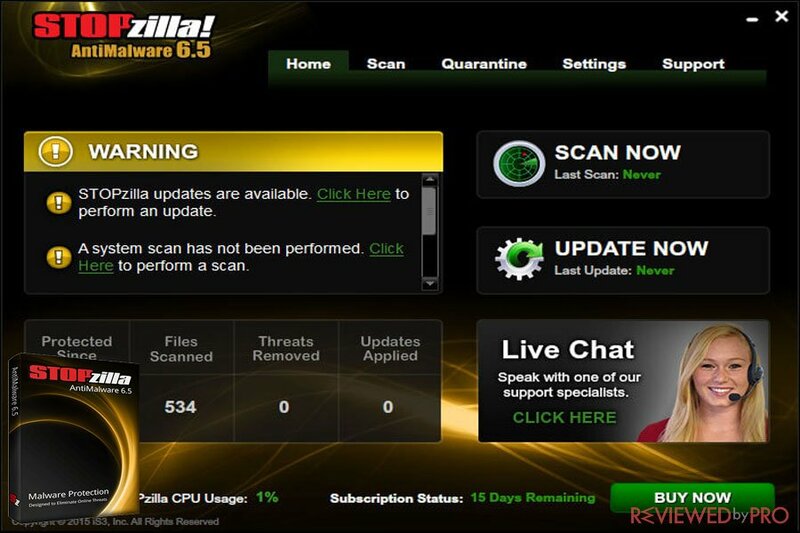 STOPzilla AntiMalware also has an intuitive interface that provides users with optimal performance and protection. STOPzilla AntiMalware might be one of the easiest malware removal tools available. It is worth to mention that STOPzilla AntiMalware software has received a number of awards and rave reviews. In addition, the malware removal tool received a bronze award from Privacy PC. STOPzilla AntiMalware applies a thorough database that allows users to easily remove any kind of malware or spyware from their PC, ensuring that their personal data is safe. STOPzilla AntiMalware also uses minimal CPU resources but still provides users with extensive protection. Even if STOPzilla AntiMalware runs together with other security and antivirus software, your computer still works as fast as possible. STOPzilla AntiMalware tool is praised by customers in the USA. They admit that STOPzilla works effectively and removed malware that other malware removal tools were not capable to remove. I had a Vosterin malware infection in my registry. Iorbit Malware free, SpyHunter and Malware Bytes premium could not remove it. It was preventing me from having the home page I wanted. STOPzilla AntiMalware quarantined it and let me delete it. STOPzilla is committed to providing users with the best possible products and services, this is why STOPzilla offers a 100% money back guarantee. So if users are not completely satisfied with STOPzilla security and optimization software or services, they can get all their money back. There is no risk when purchasing STOPzilla. Initial subscriptions can be refunded within a month and renewals can be refunded within 60 days of the renewal date. STOPzilla AntiMalware is compatible with the Windows operating system: Windows 10, Windows 8, Windows 7, Windows Vista SP1 with 32 and 63-bit systems, 2 GB RAM for Vista and Windows 7, at least 500 MB of free drive space and 1 GHz processor. In addition, an internet connection is required, a high-speed connection is recommended. If you face any computer-related issues, annoying malware or need help with STOPzilla products, STOPzilla provides users with Premium Technical Support. STOPzilla offers its users premium technical support that includes remote PC support and system repair and optimization. By using STOPzilla Premium Technical Support you will have your own personal computer tech support which is just a phone call away. STOPzilla techs are well trained and experienced, so whatever technical problems you run to, techs will be ready to help you. No matter what the issue is, Premium Support techs will solve it each and every time. How does STOPzilla Premium Technical Support work? If you see any errors or crashes, you can contact STOPzilla support at 1-888-909-9956. STOPzilla technicians will diagnose any issues and will help you to choose the proper service that fit your requirements and needs. While technicians repair your system issues, you can sit back and relax. After it is done, your PC is error-free and ready to be used again! STOPzilla Premium Technical Support technicians are able to remotely connect to your PC and delete viruses, spyware and malware infections. The infections STOPzilla technicians can remove include viruses, malware, spyware, trojans, search redirection and browser hijackers. STOPzilla Premium Technical Support technicians can easily resolve operating system, software and application errors. STOPzilla Premium Technical Support technicians will help to optimize your PC by cleaning your hard-drive and registry. They will also ensure that your computer is fully updated and serviced. In addition, techs will check for any unused and unwanted programs, and safely remove them if needed. STOPzilla Premium Technical support technicians are trained and experienced, so even if you do not know what is the issue, STOPzilla techs will be ready to help you. STOPzilla applies a secure connection when remotely logging into users’ PC, and they will never access any of your private files or documents without your permission and knowledge. STOPzilla Premium Technical Support receives good feedback about its helpful advice and reliable solutions. The best word to describe my experience with STOPzilla premium support is “incredible”. They helped not only fix my initial issue, which was a printer problem that has been hounding me for weeks, but they were also able to identify and show me several issues that were slowing down my computer. The technician was patient and polite and within an hour he had my computer tuned up and running better than it was when I got it. I would normally take my computer to the geek squad but for the cost and convenience I would choose STOPzilla every time. STOPzilla Premium Technical Support services are based in the USA and performed by well-trained and experienced technicians. Tech support is available from Monday to Friday 9 AM – 10 PM and from Saturday to Sunday 9 AM-6 PM Eastern Standard Time. ^ STOPzilla AntiMalware Software. STOPzilla. This entry was posted on 2018-02-23 at 06:43 and is filed under News.